CAGJ’s New Book has arrived! Order it today from CAGJ! 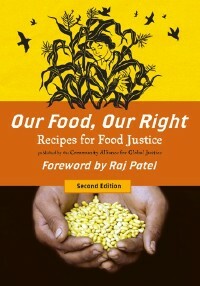 Our Food, Our Right: Recipes for Food Justice is a publication of the Food Justice Project of the Community Alliance for Global Justice. There are now two editions, combining hands-on tools for change with community recipes and political awareness to engage YOU in joining in the struggle for food justice! Our Food, Our Right promotes community knowledge sharing, self-sufficiency, accessibility, and food justice through a food sovereignty framework. CAGJ published the 1st edition in 2010, and the 2nd edition (cover at left) was released in September 2012 with a focus on “Stories of Change” – stories of successful initiatives locally and globally that are helping to create more sustainable food communities. Order your copies today! The 2nd edition costs $18.95, with reduced rates for bulk-ordering. Thank you for supporting CAGJ and Food Sovereignty! Read what people are saying about the 2nd Edition! hi! i am interested in selling copies of your newest book at the food co-op in Olympia. i am the book buyer for the westside location. i am not able to buy the books on line as we do not have a credit card so i was wondering about other options. thank you.